I’ve often wondered at what point during the film it is that the movie reviewer knows his opinion. Clearly, you don’t watch the entire film from start to finish feeling completely neutral, rendering a quality verdict only when the end credits roll. At some point, you form a hypothesis about how good or bad the film is, and then by the movie’s end, your rating is cemented. I don’t review movies. I review apps. 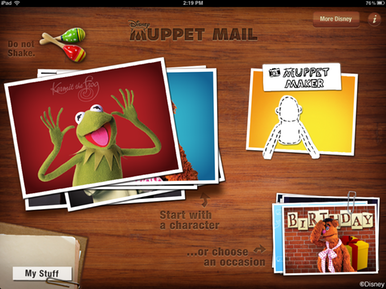 In the case of Disney Muppet Mail, a $3 app from Disney, my initial favorable rating came after about 20 seconds. Whenever you rush to send your friends and colleagues screenshots of an app within seconds of trying it out, that’s a pretty good sign. As I see it, there are two kinds of people in this world: those who love the Muppets, and those who merely like them a whole lot. Muppet Mail should appeal equally to both groups. Muppet Mail lets you create Muppet-themed e-cards to send (via email, Facebook, or the Web) to friends. The app exhibits a Muppetean sense of humor from the get-go: The home screen includes a maraca button labeled Do Not Shake; tap it, and the elements on the screen all start shaking. Another screen features a similarly tempting fan that, when tapped, blows all the buttons on screen out of order. Wokka Wokka Wokka: Muppet Mail lets you share Muppet-themed cards, and you can create your own Muppets, too. When you create cards with Muppet Mail, you can choose whether to start with a stock Muppet (like Kermit, Animal, or the Swedish Chef), to create your own Muppet, or to choose a specific occasion-themed template (like love, birthday, or get well soon). When you start with an existing Muppet, you choose among numerous templates starring your character of choice. Once you find one you like, you customize it to suit your needs. Choose a Kermit-themed template, and you can move, resize, or rotate Kermie himself, and do the same with his name. You can add other characters to the card; each is available in a variety of poses, and each of course can be rotated or resized, too. Sometimes the controls get a bit fussy as the screen gets more crowded—you’ll move Gonzo when you’re really trying to rotate Miss Piggy—but it’s very manageable. You even get simple controls to arrange the items you place further forward or back, meaning you can dictate whether it looks like Rowlf is standing in front or behind Rizzo the Rat. You can also add Muppets of your own creation, but we’ll get to that later. Other options include dozens of backgrounds, a variety of stamps to add to your cards, and the ability to place text in an assortment of fonts, sizes, and colors. Once you’re content with your card creation, you can save it (meaning you can tweak it more later) or share it. When you share Muppet Mail creations, you get three options: You can share via email, which sends your entire card embedded in the message—no links necessary; via Facebook; or by getting the direct Web link for your card and then sharing that. It's Like Some Kind of Torture: Muppet Mail can analyze a photo and create a Muppet version. 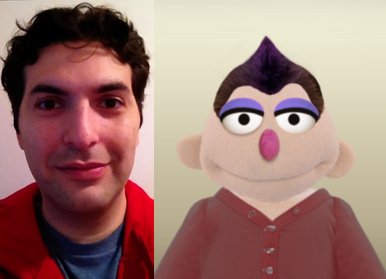 In this image, the author’s original photo is on the left; that's the Muppet version at right. The Eyes Have It: Though Muppet Mail is packed with options for customizing your own Muppets, you'll soon wish for even more accoutrement. 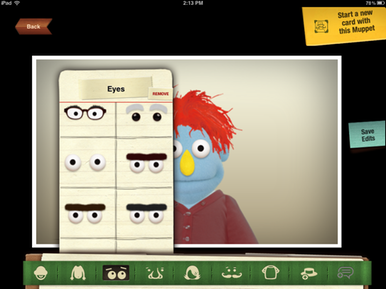 When you create cards using your self-made Muppets, you can even turn them into videos by typing in text for a speech synthesizer to voice. (You choose the gender, pitch and, speed of the voice.) The accompanying mouth animation is simply terrible, but it’s amusing nonetheless. Muppet Mail’s third option is creating themed holiday cards from built-in templates. At least one template has a typo in text that you can’t edit (“wierd”), but the templates are impressively designed. They’re not too customizable, though; you add your text, and that’s pretty much it. So Muppet Mail isn’t perfect. But it’s a lot of fun to play with. Whether you send lots of Muppet-themed greetings or just enjoy Muppetifying your friends’ faces, the app packs in plenty of fun. At least, it does to moi.